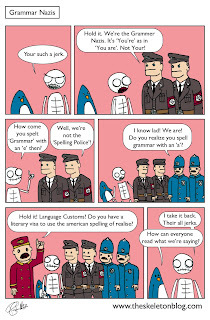 Today's comic is Grammar Nazis! It's got nazis in it so I know it will get more hits than some of my other posts. If I was smart I'd do all of my comics about nazis. There seems to be some sort of weird fascination with Hitler and nazis we just can't stop talking about them or making comics or TV programs about them or ending arguments on the internet by calling the other person a nazi. In computer games and movies there are 3 types of people that you can just mow down and blow up and no one bats an eye lid. Zombies, Aliens and Nazis. These aren't real people like you or I so you can shoot first and ask questions later.